Diane Simpson is one of the most entertaining and informative speakers you will ever hear. A handwriting expert and Profiler, she is funny, original and, as they say, something completely different. She advises big business on executive recruitment and has worked on high profile crime investigations including the infamous Yorkshire Ripper. She has appeared on more than 100 television and radio programmes and as well as being one of P and O’s most esteemed lecturers, she is a member of the Chartered Institute of Bankers Exclusive Speaker Panel. After dinner presentations, luncheons, medical conferences, seminars, training sessions and informal gatherings. Diane offers a range of talks appropriately tailored to her audience. Her humour is dry and witty; her anecdotes are first-hand and amazing and her hilarious, but non-invasive audience participation is a well established norm. She is a member of the British Institute of Graphologists; The Graphology Society; Victim Support; Friends of Broadmoor; Appeal Council of the Psychiatry Research Trust; Chartered Institute of Bankers Speaker Panel and Mensa. 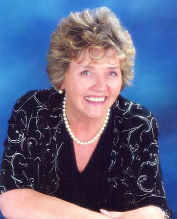 Her books include: “Graphology with Diane Simpson”; “The Analysis of Handwriting” and “Your Handwriting and You”. She also writes the hugely popular Graphology column in Marketing magazine.